When you’re a backyard boatbuilder and you don’t have a garage or shed, you have to get creative. Which is why, if you look out our kitchen window, you’ll see a workbench, and the bits and pieces of plywood, which will one day become our John Welsford Navigator sailing dinghy – all set up on our deck. But right now, you might also see this cheeky squirrel. 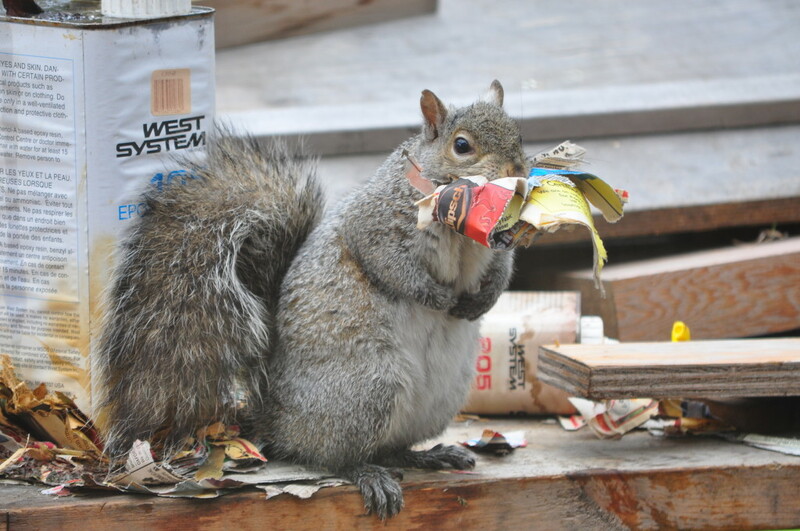 It’s nest building time, and Mr. or Mrs. Squirrel has decided that the newspaper under our can of epoxy will make the perfect nest lining. When Patrick took this photo, the squirrel was sitting on the workbench, looking at us, paws tucked up, as if to say “Me? I’m a good squirrel, really! Aren’t I cute?” I know what you’re thinking – squirrels are just rats with good PR – but if you’d seen this cheeky squirrel shredding newspaper and then carefully folding it into his mouth, I think you’d have to agree – the PR is working!